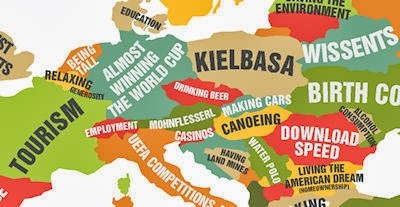 What Each Country Leads The World In is a map created by Doghouse Diaries. The map shows what every country is number 1 at. For example, the USA is number 1 at Nobel laureates and getting killed by lawnmowers. My country, the Netherlands, is number 1 at having the tallest people in the world. I can get there. I guess it was just temporary. yeahhh download speed .... true!! !